0 – Ivory Coast failed to win the Africa Cup of Nations despite not conceding a single goal in the entire tournament. Zambia beat them 8-7 on penalties after the teams played out a goalless draw in last night’s final. 3 – All three finals in which Ivory Coast have played have gone to a penalty shootout after finishing 0-0. They won the final in 1992 and lost in 2006. 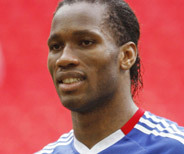 2 – Didier Drogba missed a penalty in normal time. The Ivory Coast striker also missed from the spot in the 2006 final.